Event Description: Charleston is a wonderful, atmospheric place for a corporate team building treasure hunt. Location History: Founded in 1670 at the junction of the Ashley and Cooper Rivers, historic Charleston epitomizes “Low Country” Southern Charm: shaded porches, stately homes and gracious hospitality. 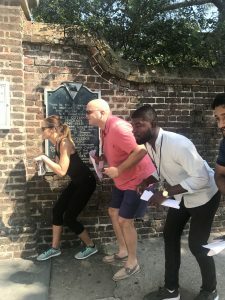 During your corporate teambuilding treasure hunt… expect to start amongst the tree-lined Battery Park, in full view of nearby Fort Sumter, then follow horse carriages through cobblestone lanes south of Broad Street; explore the bustling Old City Market; swing in the giant swings along Waterfront Park; and roam the eerie chambers of a Revolutionary Era dungeon. or oysters at A.W. Shucks.